NIKON AT JONES BEACH THEATER HAS BEEN ABLAZE WITH CONCERTS THIS SUMMER AND THE WILDFIRE FLARED HIGHER WITH SLIPKNOT‘S TOUR STOP AT THE LI AMPHITHEATER ON SATURDAY, AUGUST 1, 2015. LAMB OF GOD JOINED THE ‘SLIPKNOT: SUMMER’S LAST STAND TOUR’ WITH OPENING PERFORMANCES BY MOTIONLESS IN WHITE AND BULLET FOR MY VALENTINE. SLIPKNOT ARE TOURING IN SUPPORT OF THEIR FIFTH LP AND FIRST IN SIX YEARS, .5: THE GRAY CHAPTER, RELEASED ON OCTOBER 21, 2014. LAMB OF GOD STARTED OFF THEIR SET WITH A NUMBER OF MEMORABLE CLASSICS. THE BAND’S “WALK WITH ME IN HELL” GOT THE CROWD ADEQUATELY MOVING FOR A SHOW THAT PROVED TO BE RIPE WITH HEAVY UNDERTONES AND INSANE MUSICAL CARNAGE. “NOW YOU’VE GOT SOMETHING TO DIE FOR” EXPLODED EARLY IN THE SET AND INTO NEW (BUT IMMEDIATELY CATCHY) SONGS LIKE “STILL ECHOES” AND “512″ FROM THEIR LATEST ALBUM, VII: STURM UND DRANG. A STRING OF OLDER SINGLES TIED THE SET TOGETHER WITH A PERFORMANCE OF “REDNECK” CAPPING OFF AN OTHERWISE AWESOMELY ENERGETIC SET. CONCERTGOERS WERE WELL PREPARED FOR SLIPKNOT’S PERFORMANCE BY THE TIME THEY HIT THE STAGE. WHAT THEY WEREN’T PREPARED FOR WAS THE BARRAGE OF CLASSIC, HEAVY HITTING ANTHEMS SANDWICHING SOME OF THE MOST POWERFUL NEW MATERIAL PENNED BY THESE METAL ICONS. THE ENERGY WAS FIERCE AND THE SHEER SIZE AND NATURE OF THE STAGE SETUP WAS EXPANSIVE AND DAUNTING TO ANY VIEWER. COMPLETE WITH FIRE, EXPLOSIONS, THE MASSIVE GOAT’S HEAD CENTER PIECE, AND THEIR VERY OWN PORTAL TO HELL, YOU COULD POSSIBLY AND LITERALLY SAY THE GUYS OF SLIPKNOT HAVE SOLD THEIR SOULS TO ROCK AND HEAVY METAL. JUDGING BY THE PACKED HOUSE AND DROVES OF FANS STILL PLENTY EXCITED TO SEE THEM, THE STAGE THEME AND PYROTECHNICS HAS BEEN A WORTHY INVESTMENT. CHRIS FEHN AND SHAWN CRAHAN MAKE PLAYING PERCUSSION SEEM EFFORTLESS AS THEY, ALONG WITH THEIR DRUM KITS, WERE HOISTED SEVERAL FEET ABOVE THE STAGE BY A ROTATING SCISSOR LIFT. WHEN NOT WORKING THE TURNTABLES, SID WILSON CAME DOWN FROM HIS PLATFORM AND DANCED WITH VIGOR AS IF DRIVEN BY INSANITY. 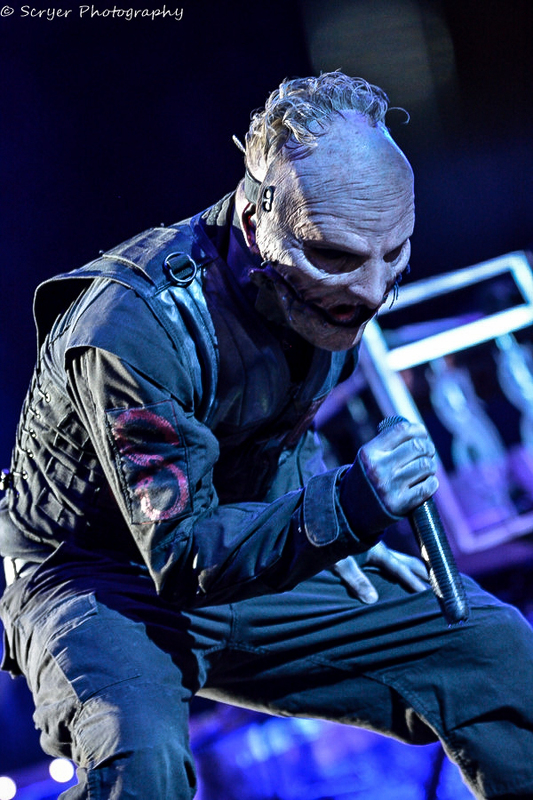 DURING A BRIEF INTERMISSION, LEAD VOCALIST COREY TAYLOR TOLD FANS TO TAKE A LOOK AT THE PERSON NEXT TO, BEHIND, AND IN FRONT OF THEM. WITH THAT SAID, HE TOLD THE CROWD TO ALWAYS REMEMBER THAT EVERYONE IN THE HEAVY METAL COMMUNITY IS A FAMILY, THAT THEY WERE HIS FAMILY. WITH A ROAR OF CHEERS RESOUNDING FROM EACH SIDE OF THE NIKON AMPHITHEATER, TAYLOR HAD BUTTERED UP AN AUDIENCE, WHO WERE THIRSTY FOR MORE SLIPKNOT THEATRICS. WITH THAT LEVEL OF PRODUCTION, ENERGY, AND VICIOUS CROWD OF FANS, IT IS NO WONDER WHY SLIPKNOT, A BAND OF NINE CONSTANTLY MOBILE MEMBERS REMAIN STRONGLY RELEVANT AND SIGNIFICANTLY INFLUENTIAL IN HEAVY METAL MUSIC. 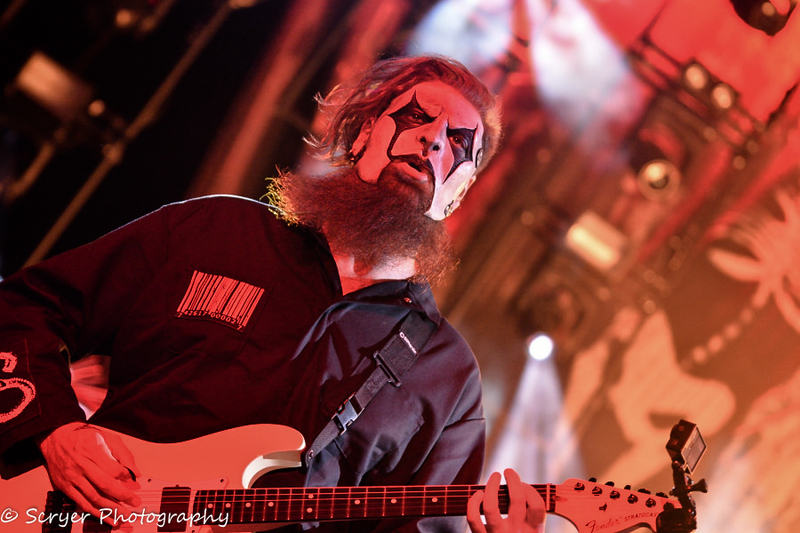 SLIPKNOT SONGS THAT HAD A HUGE IMPACT ON AUDIENCE INTERACTION WERE “SARCASTROPHE,” “THE DEVIL IN I,” “CUSTER,” “SPIT IT OUT,” AND “PSYCHOSOCIAL.” THE KNOT WILL BE ON THE ROAD WITH FELLOW TOUR MATES LAMB OF GOD, BULLET FOR MY VALENTINE, AND MOTIONLESS IN WHITE UNTIL THEIR FINAL TOUR STOP TOGETHER ON SEPTEMBER 5, 2015 IN DALLAS, TX. NY SLIPKNOT FANS, WITH MANY WHO TRAVELLED FROM AFAR, RECEIVED A MACABRE PERFORMANCE THEY WON’T SOON FORGET.